Analytics is a strange mix of art and science. It is used to analyse large amounts of data by applying statistical tools and techniques in order to generate business insights. Analytics has traditionally been used in industries like financial services, retail, healthcare and telecom. Lately however, it is finding uses in various new fields as well. Sports, social media, e-commerce, gaming and even HR are a few examples of recent adopters of analytics. The 2013 Analytics Placement and Salary Report by Jigsaw Academy and Analytics India Mag (AIM) is for both aspiring analytics professionals and employers alike. Consider it your personal handbook or resource to help you navigate today’s hiring environment, determine remuneration levels and plan budgets. We give you a portrait of the industry this past year, while also giving some predictions about the future. We have benchmarked salaries sector wise, allowing employers to compare their remuneration standards to industry standards. Employees and wannabe analytics professionals on the other hand can use this guide to validate their earnings or remuneration packages offered. This guide is divided into 3 parts. The first part gives a portrait of the past year and predictions from our panel of experts about what is to come. In the second part, we focus on analytics recruitment. We spoke to a number of people who have gone through the analytics recruitment process (some as recruiters and others as aspiring recruitees). Based on their invaluable experience, we have identified tips and best practices for those who are looking to hire and those who are looking to get hired in analytics. In the final part of the report, we present the results of the salary survey that was conducted across India. We hope you find this guide useful. If you have any questions on the current hiring landscape in the analytics industry, you can reach out to our team at +91-92435-22277 or info@jigsawacademy.com. You can visit us at www.jigsawacademy.com and www.analyticsindiamag.com. In this section, we have compiled detailed information on the salaries in analytics – at different experience levels as well as across different kinds of analytics organizations. The first split is across the various experience levels. We have divided the population of analytics professionals into 4 different levels based on years of experience within the analytics industry. – This includes companies such as Genpact, Accenture, WNS etc. which offer analytics as one of the outsourced services in the portfolio. IT Companies – This includes IT companies such as Wipro, TCS, Infosys etc. that are now looking at analytics as the next growth engine. In-house units – This includes companies that use analytics to support their own businesses such as HSBC, Citibank, Tesco, Target etc. Mu Sigma, Fractal analytics, Marketelligent and Gramener. We have presented the average salaries across the 4 experience groups as well as across the 4 different types of analytics organizations. Further, in order to capture the broad range the salaries cover, we have also added the 10th and the 90th percentile salary numbers for each group. Knowledge process outsourcing is a part of business process outsourcing or BPO as it is commonly known. KPOs offer outsourcing services for high-end processes like analytics as opposed to BPO activities such as Customer service. There are hundreds of KPO companies in India and the size of the KPO industry is estimated at upwards of $10 billion. They offer a variety of high-end services to their clients and analytics is one of them. KPOs offer exciting opportunities to those who are looking to move into analytics. Companies like Genpact, WNS, McKinsey Knowledge centre are all examples of such companies. Our study found that KPOs offer the highest average salaries at entry level positions amongst the 4 different types of analytics organizations. However, as we move up the experience levels, the difference in salaries between KPOs and others reduces and KPOs are not as attractive for someone with 5 years and more of experience..
With an average salary of Rs. 5.6 lakhs at entry levels, KPOs are the most financially attractive option to enter into analytics. Financial benefits aside, KPOs are able to offer some other options that make them a good place to work. KPOs offer analytics services to a wide variety of clients. This means that they are able to offer their employees opportunities to work on different clients and different industries. Our study shows that those working in KPOs for 2 years or more have worked on 4 different clients and 2 different industries on an average. The flexibility to work on different clients and industries is a big plus for KPOs and makes them a favoured destination for those starting off in analytics. India witnessed the IT revolution in the 90s. Companies like Infosys and Wipro have built billion-dollar businesses by servicing the IT needs of organizations around the world. With growth in IT stagnating in the last few years, these companies are now looking at analytics as the next big growth driver. Indian IT companies are investing heavily in building analytics capabilities and they offer another option to analytics aspirants. IT companies are trying to emulate the business model of the KPOs and we found a lot of similarities between the two. IT companies also offer attractive entry level salaries in a bid to lure the best analytic talent from engineering colleges and b-schools. They are also able to flex their muscle at the higher levels and offer fairly attractive salaries even at senior positions. There is a disadvantage of working in the analytics team of an IT company as well. IT companies have a strong software mentality and sometimes they struggle to adapt to the reality of the analytics market. With entry level salaries of Rs. 5.5 lakhs and director level salaries averaging at Rs. 23 lakhs, IT companies certainly offer an attractive option to analysts. Analytics professionals are used to working in lean and nimble setups and the bureaucracy of a large IT company can be frustrating at times. However, with entry level salaries of Rs. 5.5 lakhs and director level salaries averaging at Rs. 23 lakhs, IT companies certainly offer an attractive option to analysts. In-house or captive units differ from the other analytics companies in the sense that the business they are serving is not a client’s but their own. Banks like Citibank and HSBC and retailers like Tesco and Target are good examples of companies with captive analytics teams. The big advantage of working in a captive is that one is much more closely aligned to the business here. Professionals working in these captive units felt that it was easier for them to see the impact of their analyses because it was for their own business. Working for your own business has advantages of proximity but it also has a string disadvantage. Captive units do not offer you a chance to work on different industries or different organizations. Obviously, the client and the industry always remain the same. highest salaries to retain their analytics talent. Perhaps, this is the reason why captive units have to offer the highest salaries to retain the people. Salaries at mid level, manager level and director level are the highest in captive units. Analytics aspirants who are focused on one particular industry will find captive units to be an ideal place to work. They encourage specialization and emphasize building domain knowledge. However, they make up for it to a certain extent by also providing varied and challenging work. The quality of work in some of the niche analytics companies can be very high. Salaries at niche analytics companies average at 4.5 lakhs at entry level and go up to 16 lakhs at director level. companies are an attractive option. In this table we can see the average salaries by years of experience for all the 4 different types of analytics organizations. KPOs offer the highest average salary at the entry level. IT companies are the next best pay masters coming in slightly below the KPOs. In-house analytics teams or captive units offer the highest salaries at all the other levels – i.e. the mid level, the manager level and the director level. IT companies also offer good salaries at the director level (10+ years of experience), coming in just behind the captive units. There are plenty of different options for analytics aspirants. If one is looking to enter this field, KPOs and IT companies offer financially attractive options. Niche analytics companies offer more varied work which can sometimes be very challenging. In-house units offer the chance to focus on one industry and build extensive domain knowledge in the area. As part of the study, we also conducted a city wise survey. We have collected and compared average sala- ries for various cities in India as well as the national average. Average salary in analytics in India is Rs. 10.35 lakhs. 60% of the analytics professionals in India earn over Rs. 6 lakhs per annum and 20% earn over 15 lakhs per annum. 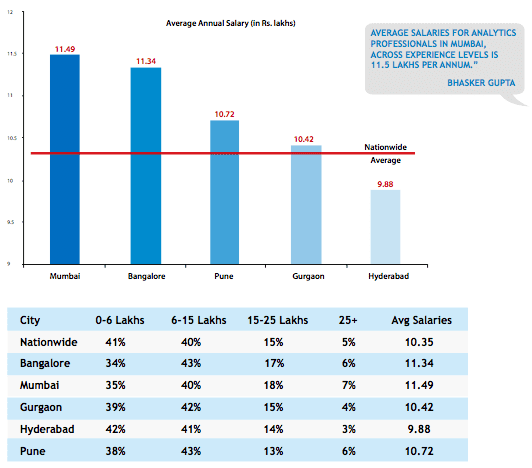 Mumbai has the highest salary amongst all cities at Rs. 11.49 lakhs. Bangalore comes a close second at Rs. 11.34 lakhs. If we adjust these numbers for the cost of living, Bangalore will actually have the highest salaries in analytics amongst all cities in India. Gaurav is an MBA from IIM Bangalore with over a decade of experience in the field of analytics. He has worked across multiple verticals including financial services, retail, FMCG, telecom, pharmaceuticals and leisure industries. Currently, Gaurav runs Jigsaw Academy, an analytics training company. You can also visit his blog – www.analyticstraining.com. The best article so far in analytics,, captures all the aspects of the profiles and companies in this space…. Thank you very much Mr. Gaurav. The article provides value added insights with exact cut off points, which we consider while thinking.